Stefan Gugushev is the founder and Managing Partner of the top tiered Gugushev & Partners Law Office. From January, 2015 Stefan is an Arbitration Judge in the International Court of Arbitration. During 2004 – 2005 he was acting on behalf of a local law firm as the team leader for the local legal dedicated group of Morgan Stanley and Freshfields Bruckhaus Deringer in Bulgaria over the privatization of the Bulgarian Tobacco Monopoly. Stefan also has six months experience as an outsourced international legal consultant acting for Hersh & Hesrh Law Offices in New York, USA. Stefan has also participated in numerous legal researches in relation to preparation of comparative analysis on EU and Bulgarian legislation in the sphere of concessions and public offering of securities for the needs of Bulgarian Parliament. He is a member of the Association Advocates Europe, prominent member of the Rules of Law Institute and member in the Association for Internal and International Arbitrage, Sofia, Bulgaria, International Bar Association. 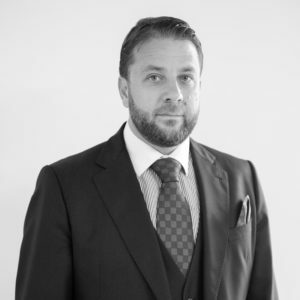 Stefan is a qualified solicitor with more than 12 years of professional experience. He obtained his Master degree in Law at Sofia University St. Kliment Ohridski, Bulgaria. During the period in between 2001 and 2002 he has covered two specializations – respectively in American Law – Judicial Perspective with the Harvard prof. Steven Plotkin and American Business Law with the Texas University prof. Sheila Hochhauser. Stefan has successfully completed a specialization on “International Mergers and Acquisition” in the London College of Law.